In this article, my goal is to provide a more in-depth understanding of the importance of water and hydration to human health. In my recent research on these subjects, it became clear that our common understanding of water is inadequate to provide us with the knowledge of how we may significantly improve our health using water in ways that can vastly improve the hydration and health of our tissues and cells. To accomplish my goal, it is important to gain a better understanding of the fourth state of water and how the water in our bodies are primarily in this state. A relatively short video by Dr. Gerald Pollack provides significant illumination on this subject. His book The Fourth Phase of Water: Beyond Solid, Liquid, and Vapor is recommended for those wishing to study in greater depth on this topic. The fact is that most of the water in the human body exists in this fourth or “structured” state. Furthermore, Dr. Pollack points out that water surrounding colloidal particles such as silica colloids is also in this structured state. Dr. Patrick Flanagan has applied this understanding along with a method of producing nanometer sized silica colloids to enable greater hydration of the body, enhanced absorption of nutritional ingredients into cells, and improved cellular detoxification. Dr. Flanagan has incorporated these elements into his Crystal Energy® product. To provide quantification of the benefits of Crystal Energy, I have provided a somewhat simplified version of an article titled: Quantitative Analysis of Membrane Diffusion Kinetics and Surface Tension Differentiation by a Colloidal Silicate Minerals by Cory J. Stephanson, PhD and G. Patrick Flanagan, MD, PhD. For those wishing a more complete understanding of hydration and Crystal Energy, please read their full article. Water (H2O) has a profound effect on our lives. The surface of the earth is 75% covered by water. The human body is about 67% water by weight and because of its low molecular weight 99% of the molecules in the human body are H2O. 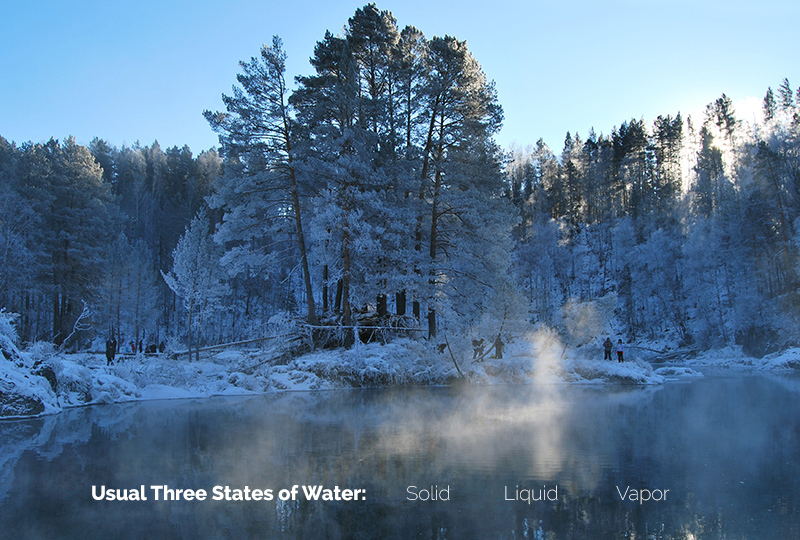 According to chemistry books there are three states of water solid (ice), liquid, and gas (vapor). However, deeper studies of water in more recent years have revealed a fourth state of water called by various names such as exclusion zone (EZ) water, structured water, fourth phase of water, and crystalline water. One of the primary researchers of water is Dr. Gerald Pollack from the University of Washington. Dr. Pollack’s TED talk included below (https://www.youtube.com/watch?v=i-T7tCMUDXU) gives us a broad view of the properties of the fourth state of water. It is highly recommended that you view this video as the facts revealed are not commonly known, but are profoundly important in our lives! The issues of hydration of the human body are highly important. With regards to physiological and biological implications, significance and impact, no nutritional substance is equal to or greater than the importance of water. Water maintains multifaceted uses biologically as a solvent, catalyst, and carrier for other reactions and compounds. The interaction of water and biological fluids is a profound topic that bears significant nutritional consideration. Changes in physical rheology of water can have a profound effect on the amount of materials that water can carry to and from the interior of cells. With aging, the body’s mechanisms of water balance are disturbed, increasing the risk of dehydration (and loss of hydration) among the elderly. Dehydration is indeed the most common fluid disorder among older persons, and it can have considerable clinical impact. It is estimated that between the ages of 30 and 70 years old the body loses about 15% of its capacity to retain water. Reasons for the loss of capacity to retain water include: 1) The elderly often experience reduced thirst sensation which leads to decreased fluid consumption, especially following water deprivation, 2) As a consequence of aging, renal water conservation is impaired. Aged kidneys are less able to concentrate urine, and thereby to retain water during water deprivation, and 3) Aging is associated with limitations such as reduced swallowing capacity, reduced mobility, or comprehension and communication disorders, which can lead to insufficient fluid intake, 4) Disease-related factors, such as fever, diabetes, or incontinence can increase water losses, and 5) Dehydration may also be caused by environmental factors (warm temperature, inadequate knowledge or the lack of time of care workers in institutions contributing to inadequate fluid intake) or iatrogenic factors (medications including laxatives, diuretics or angiotensinconverting enzyme inhibitors, and medical procedures such as those requiring fasting). The great majority of people do not recognize the absolutely crucial value of drinking the right kind of water for purposes of hydration. When doctors say, “Drink plenty of water or you will become dehydrated,” they are talking about the water around your cells, the intercellular water. However, here we’re talking about cellular hydration, the water inside the cells themselves. Research in the field of cellular hydration has shown that when the cell swells up, it triggers an anabolic mechanism in the body, which is a healing mechanism. It is accompanied by positive nitrogen balance, protein synthesis, and growth hormone release, equivalent to useful levels even in older people. Cellular hydration also results in a reduction of cell acidity, reduced autoimmune response, increased fat burning, DNA repair, and increased resistance to viruses. Now when the cells become dehydrated, it triggers a catabolic state accompanied by muscle wasting, cell hypoxia (oxygen starvation), DNA damage, and accelerated aging. 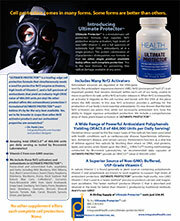 As a result the cell becomes more sensitive to free radicals and more susceptible to viruses and autoimmune diseases. Virtually all symptoms of aging are the result of cellular dehydration accompanied by free radical damage. As such, proper hydration is essential for improved health. Surface tension is an important indicator of the rheology or flow characteristics of water through a living system and across cell membranes. When a drop of liquid is placed on a solid or another secondary liquid, the first liquid either spreads to form a thin, more or less uniform film or remains as a discrete drop. The degree of interaction between the drop and the film is known as wetting. The former behavior is generally described as complete wetting, and the latter as incomplete or partial wetting of the surface. The external measure of the degree of wetting is the contact angle, i.e., the angle formed between planes tangent to the surfaces of the solid and the liquid at the wetted perimeter. A zero contact angle is the condition for complete wetting of a solid by a liquid (e.g., water on clean glass). This concept is exceptionally important in the discussion of the nutritional aspects of a liquid. To fully discuss the phenomena and details of liquid interaction, it is important to understand the concepts of three terms: surface tension, wetting tension, and wetting angle. Surface tension is the force that exists between a liquid and the atmosphere it is in. For example, in atmospheric air, a drop of water will bead up on some solid surfaces. It is the surface tension existing between the water and the air that allows this to occur. The drop of water can spread out on another solid surface if the new surface has molecular forces (surface energy) high enough to overcome the water/air surface tension and draw the water flat onto it. Wetting tension is the maximum liquid surface tension that will spread, rather than bead up, on the film surface. It is a measurable property that estimates a film’s surface energy. Wetting tension is determined by applying different test solutions of increasing surface tensions until one is found that just spreads (wets) the film surface. Units are dynes/cm. Contact or wetting angle (the angle θ shown in the diagram below) is a measurement of the behavior of pure water in contact with the film surface. The surface energy of the film controls whether the droplet tends to stand up or flatten out. This is quantified by measuring the contact angle of the droplet with the surface. 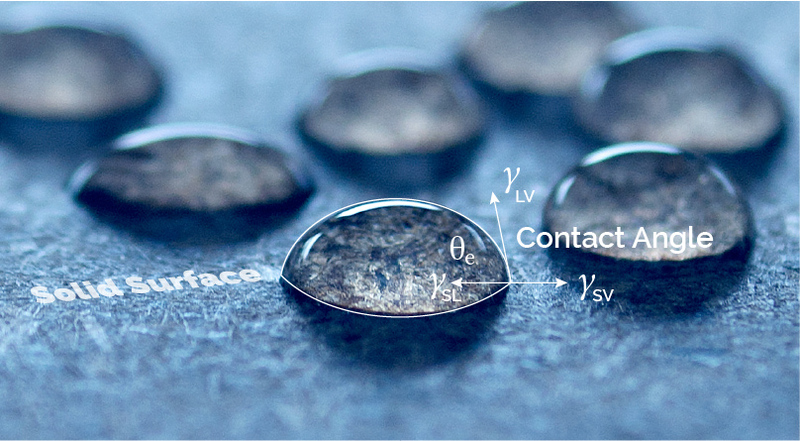 A higher energy film will cause the droplet to be flatter and closer to the surface, which results in a smaller contact angle value. Ordinary water has a high surface tension, as well as a high wetting angle, which means it has a difficult time wetting the cells within the body. In the body our cell membranes contain a significant amount of phospholipids (fats), which have low surface tension of about 45 dynes/cm. Cells require a surface tension of about the same range for water to wet the cells, thus passing through the cell wall carrying nutrients etc. This concept is the same relationship as the idea that oil and water do not mix. Normal tap water has a surface tension of 73 dynes/cm which is able to suspend the cells in the body, but is not in intimate contact with the surface of the cell, passes through the body, and is not fully utilized by the cells. Higher surface tension water can actually dehydrate cells in which it comes into contact. The lower the surface tension, the lower the wetting angle and the “wetter” the water becomes. With a lower surface tension and a low wetting angle, cells become fully hydrated and the water is fully and most effectively utilized by the body. By this means, cellular hydration is achieved. Of direct biological interest, if for any reason nutrients are unable to influx into cells or efflux and remove the toxins from cells, the cells die due to accumulation of their own metabolic waste products. In order for toxins to leave the cells and nutrients to enter the cells, the cells must be in intimate contact with water. Thus, a low surface tension environment is optimal for cellular health. In fact, it has been demonstrated that an increase of over 64 times nutrient capacity was observed by doubling the speed of fluid flow. Lowering surface tension and wetting angle is directly related to the speed of the fluid across cell membranes. Hence, while water is one of the most important things we can put into our body, it is only the right kind of water that produces health and longevity. An individual could drink significant volumes of water at 73 dynes/cm, but without the micronutrients in your body to make the conversion to 45 dynes/cm, the body will be dehydrated at a cellular level. Dehydrated cells metabolize in a catabolic state, which means the body starts utilizing its own tissue for energy production, resulting in degeneration of cellular health and immune response. Over time this process may result in auto immune diseases, such as lupus, MS, Chronic Fatigue, Rheumatoid Arthritis, allergies, and many more degenerative processes. With this in mind, it is of utmost importance to make sure that the dietary intake of water is in its most useful form, i.e., the form that produces the greatest hydration in the body. 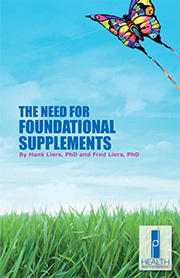 There are many compounds and supplements that claim to catalytically increased nutrient absorption, however, most are unable to produce any empirical or other evidence to support those claims. Recent assays evaluating the functionality and efficacy of the nutritional supplement, Crystal Energy®, demonstrate the innate ability of the compound to reduce surface tension and wetting angle, while increasing nutrient absorption through increased fluid speed and diffusion rates. All the while increasing the conductivity and dissolved solids within the solution. Crystal Energy®, is the retail name for Flanagan Microcluster® colloids, that were developed and perfected by Dr. G. Patrick Flanagan. Dr. Flanagan discovered that anomalous properties that sustain increased longevity and lifespan are the result of a special type of colloidal mineral found in some types of water. This is true of five main areas in the world, including Hunzaland in Pakistan, where larger numbers of people are often known to live past 100 years old while maintaining excellent health. Locals from these areas attribute their longevity to the water they drink. It was the study of these special minerals and ions that led to the development of Crystal Energy® concentrate. Microcluster minerals, which are found in Crystal Energy, alter the structure of drinking water and reduce the surface tension. These attributes are the keys to the secrets of the Hunza water. Microcluster minerals are unique in that they have a very high electrical charge (Zeta potential) and are small enough to be easily utilized in the body. Normally the charges on ordinary colloidal minerals have little or no effect on the structure of water. Colloids that are found in dead sea beds and mineral clays have low zeta potential and are too large to be used by a living system. Zeta potential represents a basic and fundamental Law of Nature. It plays a vital role in all forms of plant and animal life. It is the force that maintains the discreteness of the billions of circulating cells that nourish the organism. Microcluster minerals consist of elements and combinations of elements which are by definition in the smallest possible size range while still remaining molecules. When Flanagan Microcluster® silica colloids are diluted for drinking, they have such powerful surface energies that they have a profound and significant effect on the water, including decreased surface tension, as measured in dynes per centimeter. Hunza water has a surface tension value of 58 dynes/cm. Crystal Energy treated water has an even lower surface tension than Hunza water and a greater Zeta potential, providing a more advantageous environment in the organism. Assimilation of nutrients and vitamins from our foods is largely dependant on our body’s ability to wet and process nutrients in the digestive system. The ability to wet foods depends on the Zeta potential and surface tension of our digestive fluids. Through this mechanism, Crystal Energy demonstrates a significant impact on how nutrients are absorbed into the living system. To quantify the efficacy and mechanism of Crystal Energy, a series of analytical tests were performed: Diffusion kinetics to determine the fluid speed and nutrient absorption characteristics were measured through the spectrophotometric monitoring of visible light absorbance of a food-grade dye and select vitamins in water, osmotically diffusing across a semi-permeable dialysis membrane. Additional assays were performed following the change in surface tension, conductivity and total dissolved solids with the incremental addition of Crystal Energy to various waters. Surface Tension Analysis: The surface tension levels of ten different commercially available waters were analyzed before and after treatment with Crystal Energy. Surface tension was monitored by a Du Nouys Ring Model 21 Surface Tensiomat and measured in dynes per centimeter. Total Dissolved Solids (TDS) measurements were made with an Orion model TDS-1 meter and reported in parts per million. Conductivity was determined by a Sper Scientific SP-2 conductivity meter and reported in Siemens. For each assay, instruments were calibrated and 35.0 mL of analyte water were added to a plastic weigh boat and placed on the surface tensiomat platform. Initial readings were taken with the tensiomat, TDS and conductivity meters. Sequentially one drop of Crystal Energy was added and subsequent readings of surface tension, TDS and conductivity were taken. This protocol was followed for two and four drops as well. Each analysis was performed with six replicates. The results indicate a mean reduction in surface tension of 35% over the course of the assays. In each replicate and water type, the conductivity increased and the total dissolved solids increased. Increases in conductivity of up to 45% were observed in the treated waters. Increases in total dissolved solids up to 40% were also observed. The decrease in surface tension of 35% places most of the Crystal Energy® treated waters in the range of 43 to 47 dynes/cm clearly demonstrating the decrease in wetting angle and “wetness” of the waters. This range, as previously mentioned, is optimal for biological activity and maximized nutrient assimilation. The increase in Total Dissolved Solids shows that many minerals in the water are being broken down to their smallest, dissolved states. This is further supported by the increases in conductivity which additionally promote better assimilation, nutrient transfer, and increases in reaction kinetics. 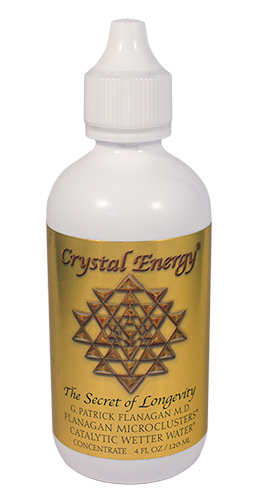 Coupled together, the addition of the Crystal Energy creates an environment optimized for increased rates of nutrient assimilation as well as toxin removal from cellular structures! Diffusion Kinetics: As a means to validate and understand the preceding results and to determine any increase in the speed of the fluids and differences in the diffusion kinetics, a second series of experimentations were executed that monitored the influx of a colored dye and vitamin C through a semi-permeable dialysis membrane over the course of several days. This environment best mimics the human cellular system and the dialysis membranes have similar diffusion properties to that of a human phospholipids cell. To start the experimentation, 190 mL of analysis water were added to a Pyrex beaker. 10 mL of a 0.5 mg/mL solution of Red #5 food coloring and a 0.5 mg/mL vitamin C solution in their respective analysis waters were added to the 190 mL beaker. 10 mL of the analysis water were added to a wetted and tied 2 cm diameter dialysis tube and suspended in the solution. Treated waters were conditioned with 10 drops of Flanagan Crystal Energy®. Readings were taken with a spectrophotometer initially and at the following intervals: 10 minutes, 20 minutes, 30 minutes, 1 hour, 4 hours, 24 hours and 48 hours. Spectra were taken from 340 to 700 nm and were blanked against the respective analysis water. Data were collected at 350 and 523 nm for the vitamin C and red #5 dye, respectively. Controls using tap, spring and distilled water and with both food coloring only and food coloring with vitamin c were used to verify the adsorption and quantification consistency of the vitamin c in solution. The absorbance data (diffusion rates) showed a significant linear increase up to the 4 hour mark, at which time the diffusion rates slowed significantly and then leveled off by the 24 hour mark and maintained the concentration up to the end of the assay at 48 hours. The mean increase in diffusion rate between a Crystal Energy treated water and a non-treated water was 2.51 +/- 0.15 (Standard Deviation 0.003) times greater. These results clearly indicate a significant increase in fluid speed and nutrient absorption. This equates to an 80 times greater potential for nutrient carrying capacity. 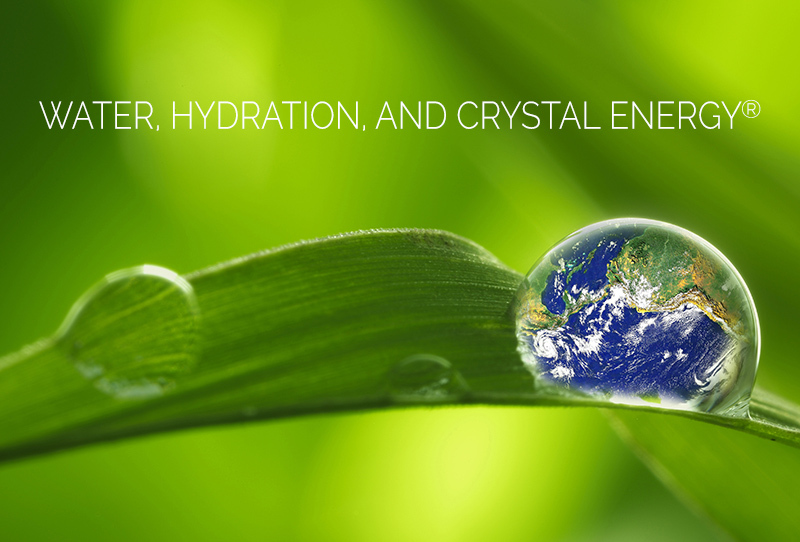 The significant increases in diffusion rate compared to controls demonstrate a profound ability of Crystal Energy® to aid in increasing the catalytic nutrient absorption properties of water . Overall, all of the precision of the data were exceptionally consistent with each other clearly indicating: 1) A mean increase in the rate of nutrient flow across the membrane of 2.5 times over that of non-treated water. 2) A mean decrease in surface tension of 35%. 3) A mean increase in Total Dissolved Solids of 40%, and 4) A mean increase in conductivity of 45%. All data indicated the requirements needed to optimize an environment for nutrient assimilation through decreased surface tension, wetting angle and increases in Total Dissolved Solids and conductivity were satisfied. Through the controlled monitoring of the diffusion of common water soluble vitamins, Crystal Energy® demonstrates the innate ability to act as a catalyst and aid in the increased rate of absorption in an in vitro, mock-cellular environment. The increase in absorption rates, coupled with its wetting properties, clearly demonstrate the Crystal Energy® conditions water to be highly optimized and essentially prepared for assimilation by the body. “Quantitative Analysis of Membrane Diffusion Kinetics and Surface Tension Differentiation by a Colloidal Silicate Minerals” by Cory J. Stephanson, PhD and G. Patrick Flanagan, MD, PhD.